AS predicted at this site ad infinitum, as well as at interviews, and within a recently released book on militant Islamic Jihad’s (social media) enablers, the overarching analysis has never wavered: Allah’s Muslim Terrorists will explode – in the very near future, and with ever more frequency – from one end of America to another. But it didn’t have to be this way. INDUBITABLY, every investigative journalist worth a damn should have seen this Allah sh-t-storm coming. Not only that, what about insiders within officialdom, privy to the most sensitive intelligence information and in control of massive assets to boot? Consequentially, the aforementioned recognize the perils at hand. Mind you, a preponderance stoke the Jihadi fires too. Wait and see. NOW, it is a given that the media is leftist-bent. By extrapolation, their mouthpieces lean in a totalitarian direction. Ditto HUSSEIN and surrogates. More trenchantly, they are rabid globalists, as are some very powerful RINO’s. Yes, the Bush’s lead the pack. But, most significantly, this brings us to the crux of the left’s collusion with Islam’s barbarians: both seek to reshape the global power structure, aka order, which necessitates the destruction of nation-states. It is a mutually beneficial goal, and it is key and core. The glue that holds them together. The ties that bind. TO that end, massive chaos and continuous killings must take place. Enter: Allah’s Muslim Terrorists! EVEN so, individuals whose sensibilities are more “delicately” inclined must immediately thrust aside their reflexive urge to deflect from frightening truths. After all, pretending that (mostly) secular leftists would never cooperate with Caliphate-driven Islamists is sheer fantasy, ala Alice-in-Wonderland magical thinking. No matter. As is known, the enemy of my enemy is my friend. THUS, if the above is internalized for what it truly is – and in order to properly connect the dots – the following digging would be a primary focus of a non-biased “Fourth Estate”, leading their reporting from there to here. Egregiously, expecting as much from an Islamic-captured media is truly a fairy tale! Simply put, it requires requisite due diligence. And, if properly executed, it would have provided a combined globalist/leftist/Jihadi road map to the stepped-up chaos enveloping America. The wider west in toto. BASICALLY, out of the Five Ws and one H (Who, What, When, Where, Why and How) taught to all budding journalists in Journalism 101, when it comes to Islamic-inspired terror attacks, the essence of the First W is always left non-examined. INTRINSICALLY, since the “who” is already known – it’s Islamic terrorists, stupid – the media is literally terrified to dig to its core. Regardless, the “who” must be established: “who” gains the most from Jihad’s swathe and global chaos, other than the actual perpetrators? IN other words, the lead of the Five Ws should be flipped upside its head, since rational folks know it is self redundant. Again, the “who” can’t be asked as if it is an unknown quantity. Rather, it must relate to the concomitant beneficiaries. F/B/O. IN tandem, the Fifth W, the “why”, should be ratcheted up full-throttle.Sans a scintilla of a doubt, asking the right questions re the “who” will connect to the “why” dots. Inextricably, they will lead directly to the underpinnings of the stepped-up terror exploding within America’s streets. CONCOMITANTLY, in spite of all the known dangers, it must be internalized that HUSSEIN (and surrogates) absolutely recognizes the dire risks associated with bringing in tens of thousands of so-called “refugees” from Jihadi-riven, Sharia Law adherent hot spots. Currently, it has been reported: military heads are defying HUSSEIN’s orders in the Middle East theater, duly alarmed that his policies are empowering the most radical Jihadis. Unprecedented. SOUTHCOM commanders have raised several clarion calls, warning U.S. citizens: the southern border is rife with Jihadis, many of whom are entering the U.S. to execute terror attacks. It doesn’t get any more dangerous, nor clearer, than that. The dangers have become so obvious, the FEDS were forced to ‘fess up, but only due to a report issued by DHS’s inspector general: more than 800 (likely, much more) immigrants granted citizenship are of “concern.” Now, why would THAT be?? Moreover, it has been established: ten times – at the very least – over the past two years terrorists slipped through the immigration process! IN this regard, is it shocking that U.S. generals and admirals recently testified before Congress that their Commander-in-Chief holds the top chain of command in contempt? Of course not. In support thereof, several commentaries at this site attest to the same. MORE pointedly, what must a rational person conclude from the continuous “lack of interest” by the FEDS, even when presented with clear and convincing evidence that Jihadis are roaming free within the nation? And, how far down the rabbit hole have America’s security agencies fallen, when even turning one’s son into the authorities for terror activities doesn’t get their prompt attention? Some 15 long years after the horrors of 9/11, much of America remains trapped in a 9/10 mindset. The latest evidence involves the alleged bomber who wreaked havoc in New York and New Jersey last weekend. The blood ran when the Chelsea blast injured 29 people, but now come reports that make the blood boil: The feds failed to connect the dots that might have prevented the weekend from hell. The reports reveal several critical facts, starting with the most important. The father of alleged bomber, Ahmad Khan Rahami, called law-enforcement authorities in 2014 and said his son was a terrorist. Ahmad Khan Rahimi who was born 28 years ago n Afghanistan made several trips to his home country and Pakistan between 2011 and 2014. During those trips, he secretly visited Quetta, the capital of Pakistani Baluchistan for covert meetings with Al Qaeda and Taliban commanders, DEBKAfile’s exclusive counterterrorism sources reveal. They also disclose that Rahimi was taken under the wing of a regular Al Qaeda controller during those visits. He was in contact with this controller, who also runs a number of sleepers in America, when he executed his three bombing attacks over the weekend in New York City and New Jersey. DEBKAfile was the only publication to link the perpetrator of the New York and New Jersey bombings to Al Qaeda instead of ISIS in its initial report of the attacks on Sept. 18. Our sources can now add that Rahimi was sent from Quetta to a Taliban camp in the southern Afghanistan town of Kandahar for training in building explosive devices and guerrilla combat tactics in urban environments. His controller in Quetta put him touch with a Pakistani woman from a Taliban family, whom he married so that he, a naturalized American citizen, could apply for a visa to bring her over to America to reinforce a clandestine Al Qaeda network. This plan fell through when the US authorities denied her application. Although he was interviewed by FBI agents about his trips, his connection to terrorist leaders in Pakistan did not come to light. Neither did the Kandahar Taliban facility appear to be known to US counterterrorism authorities, although it must be assumed that Ahmad Khan was not the only radicalized westerner trained there. The claim by Rahimi’s father that he tried two years ago to bring his son’s association with terrorists to the attention of the FBI recalls the case of the Nigerian student Umar Farouk Abdulmutallab who, on Christmas Eve 2009, failed to detonate explosives in his underpants against an American Northwest Airliner. STILL yet, lest there be any doubt as to the knock-on effects from HUSSEIN Obama’s (and surrogates) calculated efforts to strengthen Allah’s Muslim Terrorists (domestically and overseas), Americans would be wise to recognize: like it or not, they are now walking in the same shoes as Jews in Israel – the laser-focused targets of Islamic terrorists. ALAS, perhaps Americans (and others) will now understand why the Orwellian term, “safe spaces” (utilized across U.S. college campuses as hidey-holes to infantilize an already indoctrinated student body across the board, this generation of young adults), is an anathema, an affront, to Jews in Israel. IN reality, “safe spaces” in Israel are exactly what they mean: fortified spaces to run to – with barely seconds to spare – when sirens blare of incoming missiles! 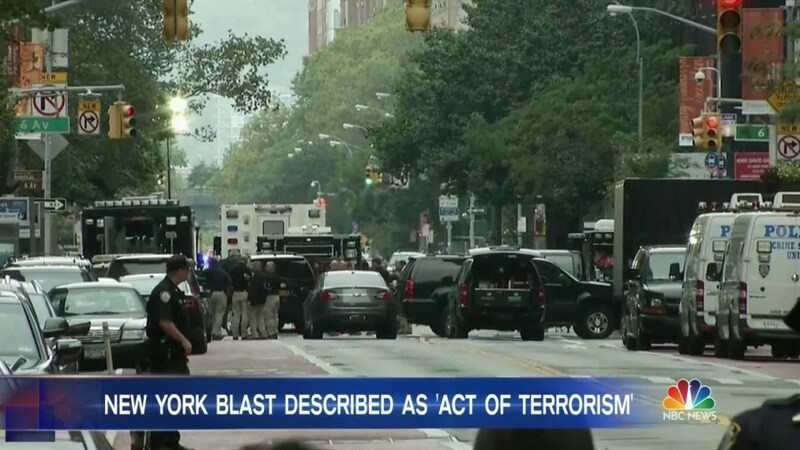 CONCLUSIVELY, if the spate of last weekend’s back-to-back jihadi terror attacks – which rocked New York, New Jersey and Minnesota – aren’t convincing enough, what exactly will be? Mind you, the very same tactics – from knife-jihad to bomb-jihad, to every terror tool in between – endemic within Israel are now playing out in the streets of America. Btw, so too will incoming missiles. SO, in an unprecedented manner, isn’t it obvious why high-level U.S. military commanders – operating in the Middle East theater – are ignoring HUSSEIN’s dictates? In tandem, is it coincidental that commanders deployed alongside America’s southern border feel compelled to blare the highest decibel alarm bells? REGARDLESS, what springs to mind from this clued-in perch is: way too little….much too late!! This entry was posted in Uncategorized and tagged military heads defying HUSSEIN's orders, SOUTHCOM commanders issue warnings, terrorists slipped through the immigration process by Adina Kutnicki. Bookmark the permalink.